"In late 1992, Quentin Tarantino left Amsterdam where he had spent five months, off and on, in a one-room apartment with no phone or fax, writing the script that would become 'Pulp Fiction'," Vanity Fair contributing editor Mark Seal read from his article for the magazine's 2013 Hollywood issue. "'Pulp Fiction' changed the movie landscape forever...And it made Quentin Tarantino." "Everybody has a favorite scene in 'Pulp Fiction,'" actor John Travolta told CBS News. "It could be the Jack Rabbit Slim ... it could be the Uma scene ... or it could be, what's in the briefcase." "Pulp Fiction was almost like a Picasso painting. It broke all the rules. It was out of sequence," Sea explained. "Travolta's character dies in the middle of the film and then comes back ... and it just kind of works in a way that I don't think anyone, including Quentin, expected." "It's difficult in the modern age of film to have a vision," Travolta explained. "And Quentin is a visionary." Quentin Tarantino exploded onto the scene in 1992 with "Reservoir Dogs", about a gang of ruthless robbers, starring Harvey Keitel. "Quentin symbolizes for me that urge that young talent has, that desire to do something, to say something, to be, to take action," said Keitel. Over the last 20 years, Tarantino has created one memorable film after another. "Django Unchained", the director's epic Western about a slave on a mission to rescue his wife, is nominated for a best picture Oscar. But it was "Pulp Fiction", a film about a group of lowlifes living in Los Angeles, that established Tarantino as one of Hollywood's finest writers and directors. "My work is kind of unmistakably me, and I like that about it. But you know, you are either going to really dig it or you're gonna be against it," Tarantino told "CBS News Sunday Morning" in 2009. 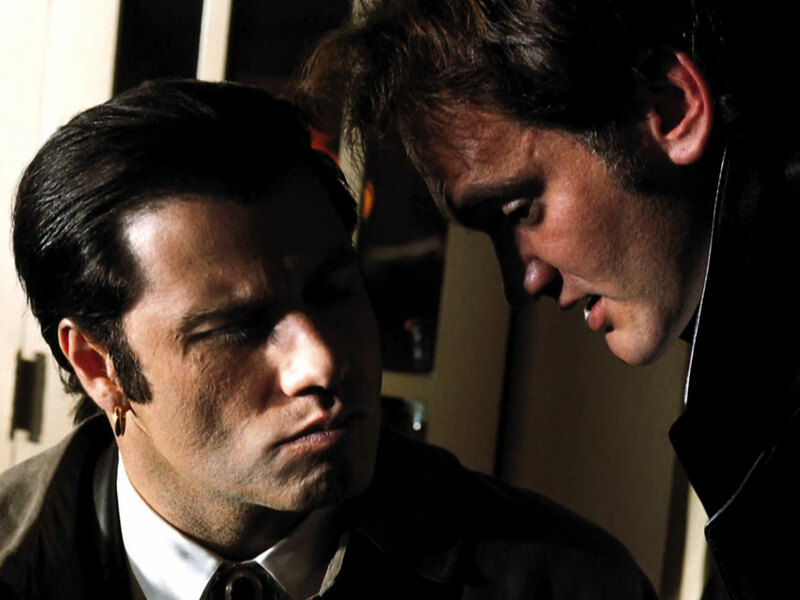 When it came to choosing his leading man, Tarantino opted for John Travolta, even though many insiders thought his best days were behind him. "I wasn't the hot ticket at that moment so he really had to fight for me," Travolta said. "He finally ... said, 'Listen, we either go with John or ... I'm not gonna do the movie.' And so I thought, I better deliver for this guy because he means business and he's so sweet to believe in me so much." Tarantino wanted Travolta to reclaim the charisma he had flashed onscreen in "Saturday Night Fever" and "Grease". He was betting audiences would love to see Travolta dance again. For "Pulp Fiction," Tarantino asked him to do the twist. Travolta had other ideas. "I said, 'the twist is fun and it's good,' I said, 'but when I was a kid there were novelty dances that were equally fun. There was the swim, and there was the hitchhiker ... and then, of course, on the TV series 'Batman', Catwoman did this dance like this," he said, demonstrating the iconic gesture from the film. The chemistry between Travolta and Uma Thurman mesmerized moviegoers. But no one was prepared for what came next. "... in these more intricate scenes, he had a vision of how he wanted to time out ... where all the characters were in the room and the timing had to be just right," Travolta said. "But when it came together, gelled, it took off like a balloon." "The needle to the heart ... you can't look away from that scene," said Seal. "I don't think anyone who saw 'Pulp Fiction' was the same when they walked out of that theater," he continued. "I know I wasn't. I mean it just stunned you." "I still have people coming over to me about 'The Wolf' in 'Pulp Fiction,'" Keitel quipped. "'The Wolf' [is] the name of the character, you know, says it all." Brooklyn-born Harvey Keitel has always been baffled by Tarantino's remarkable ability to depict tough guys.
" I asked him, "Anybody in your family that, you know, was a tough guy?' 'No.' 'Anybody associated with tough guys?' 'No.' 'You ever get beaten up by tough guys?' 'No.' I said, 'Well, how the hell did you come to write this screenplay?' And he said, 'I work in a video store. I watched movies.'" And, of course, in Tarantino's films, tough guys go hand in hand with violence, and that, initially, was a big problem for "Pulp Fiction". Every studio passed on "Pulp Fiction" and it was, in part, because of the violent. There was an uproar in Washington about violence in films. Were films becoming too violent? It's an issue that resonates to this day and something Tarantino never apologizes for. "I work in crime films, martial art movies - I guess there's gonna be a fight or two. In movies, violence can be cool," he said in a 2009 interview. Violence in Tarantino's films always seems to have a peculiar twist. "I specialize in making you laugh at things that aren't normally funny," the director told "CBS "News Sunday Morning" in 2009. "John Travolta turns to the guy in the backseat of the car and accidentally blows his head off. And that is a funny sight gag." Everything clicked in "Pulp Fiction". It's easily one of the most talked about and memorable films of the past 25 years and is analyzed to this day. "I think it was a yin yang chemistry ... you mix darkness with light - it's a dark script," Travolta said. "But you pick Bruce Willis, John Travolta, Uma Thurman that have a light essence, and if you mix that with darkness, you have humor." "It's just a great movie," Seal agrees. "I think it's still fresh and exciting and new every time you watch it. And I think it's just brilliant."